The old joke is we travel to find ourselves. But those who travel sometimes learn the finding and the losing aren’t about geography or chronology. Sometimes, we’re so caught up in ourselves, so wrought and knotted, that becoming lost is inconceivable. We’re so hyper-focused on ourselves and our stresses that we can’t “get lost”. Chaos is not of place, or time. It just is. For a while, I was chaos personnified. When unhappy and craving escape, it’s easy to think travel will solve our woes. Caught in a crazy life? Just get away! It doesn’t work that way. In fact, escaping can do the opposite, if it means adding any more stress or stimuli. It’s like trying to undo a knot only to make it tighter. As travel wore on during my second year, I tightened all that bound me. It’s been 16 months now since my father’s death. Eleven since my surgery. And then there’s the rest of life in between and after. Those knots, man. Tighter and tighter and tighter. 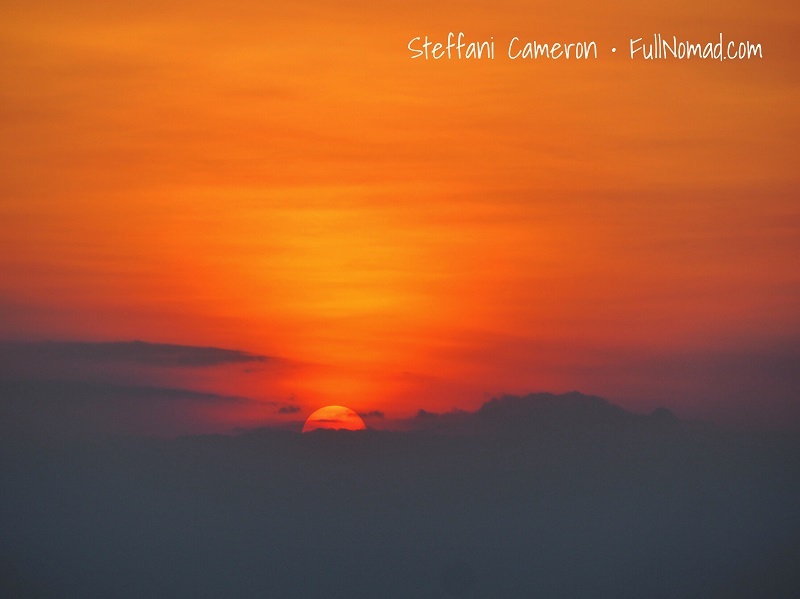 For the better part of seven weeks I have watched the fire in the sky sink into the Laotian horizon across the Mekong River. Good for the soul. Arriving in Asia didn’t loosen a damn thing. 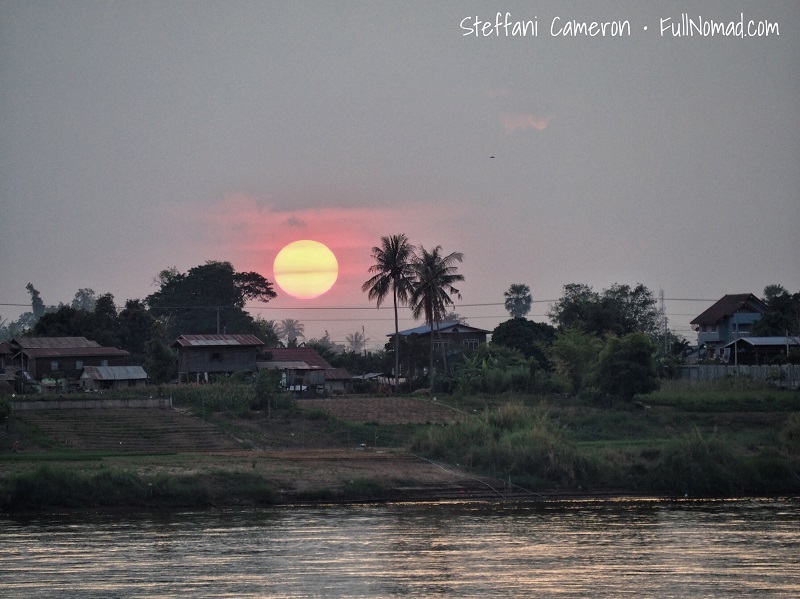 Ten weeks later, when Christmas week arrived here on the Mekong, staring out at Laos from a rural Thai village, is when I finally noticed myself starting to change. Chaos was still my natural state, and whatever calm might have been around me, I knew I had six weeks left to figure out what was next for me. I needed to deep-dive into travel research, because the end of my rental would mean needing to find somewhere else to be. The problem was, I’d lost my passion for travelling. Frustrated, it was a toss-up between Vietnam and Cambodia, and I couldn’t choose. Despite wanting to leave Asia already, flights were too expensive, and my budget required sticking it out here for one more month. With about as much passion as a coin-toss, I decided on Cambodia because that was the most recent place someone told me to go. But then what? After Asia, where to? The trouble was, I didn’t care. Where I really wanted to be was in my comfy bed I once owned back in Canada, in my huge, spacious Art Deco building with giant oak trees outside my tall windows, tucked into a fluffy wool duvet with big poofy pillows that never had another head but mine lie upon them. But I don’t have a home. I don’t have that boring bliss of waking to routine in a place that feels right all day long. And when that lack weighs heavily on you, the last thing you want to do is pick yet another place that continues to be a million miles from everything that was ever safe, boring, and comfortable. 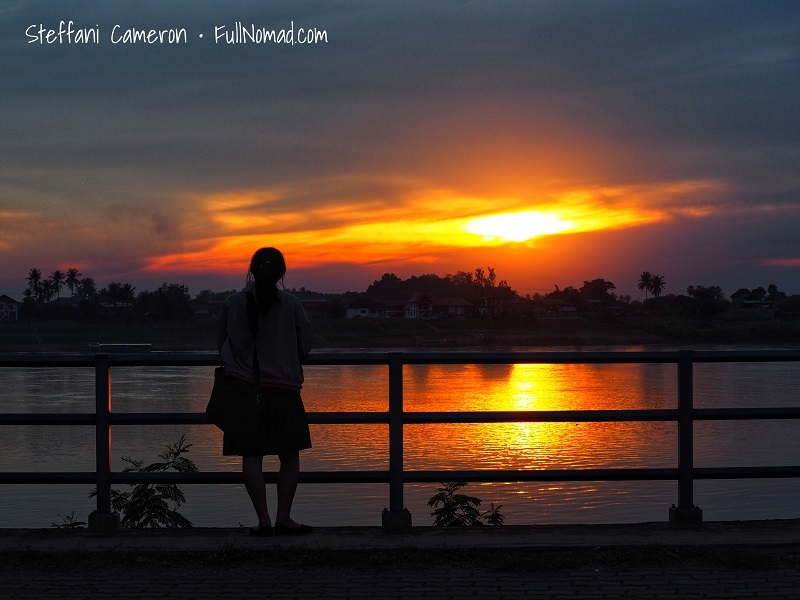 A school girl watches the Mekong River sunset. I wondered what she was thinking about, where her life would take her, what this kind of introspection at her young age would mean for her as she grows up and enters the world. I felt optimism. Coming here to Meung Mi, a rural Thai village nine kilometres from the urban hub of Nong Khai, in the province of Isaan, the gateway to Laos, my only goal was boredom. I came to sleep and to think, to work and to earn, and to finally unknot myself. I needed to open up, reconnect with the world. My passion, pfft, gone. Battery, drained. I needed recharging, to rediscover the excitement travellers require for seeing the world. I needed to clutch greedily at words, writing, life, rest, and myself. 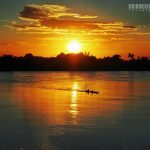 And now, forty-four days done and five days left here on the Mekong River, maybe I’ve found my missing passion. Battery’s not yet recharged, but I’m in my forties and I’m not sure batteries get recharged anymore, so that’s okay. 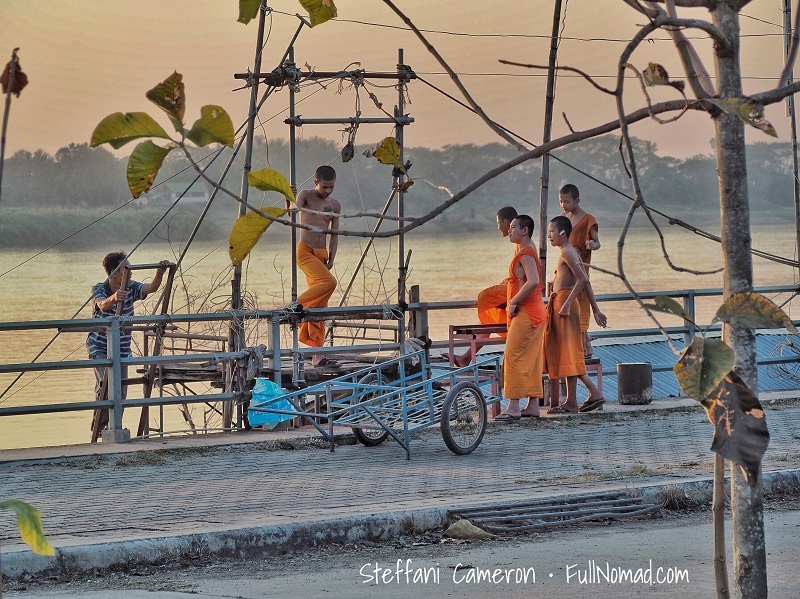 Buddhist monks talk to a fish farmer on the Mekong River as dusk falls. An unexpected bonus from the solitude of living among an agricultural community and the fish farmers on the river, spending my days working or counting passing chickens and watching dogs run free and wild all day long is, I’ve fallen in love with reading again. No small matter, friends. No small matter. I’ve always believed reading is critical for great writing. So is travel. But I’ve learned travel isn’t enough for great writing. It needs reading, too. But society and me both, in the last 20 years, we shifted to online, bite-sized ideas. Short paragraphs, brief essays, fleeting concepts. Reading, pfft. Who’s got the focus, right? Not me. And that was my undoing, in some ways, and not just on the page. When I lost my love of reading, it was akin to losing myself, that self I’ve wanted to find through travelling. Reading was everything for me, back when. By age three, I could read. Maybe it was memorization, or maybe I really knew the words, but I was on it. During high school, I was that kid reading in halls over lunch. Not because I didn’t have friends, but because I had a book. It was basic math. Have book? Will read. I read a book a week, minimum. Sometimes a book a day. From complex newsy history to rip-roaring fiction, I had a wide berth and took all comers. Good thing I worked at a bookstore, then. 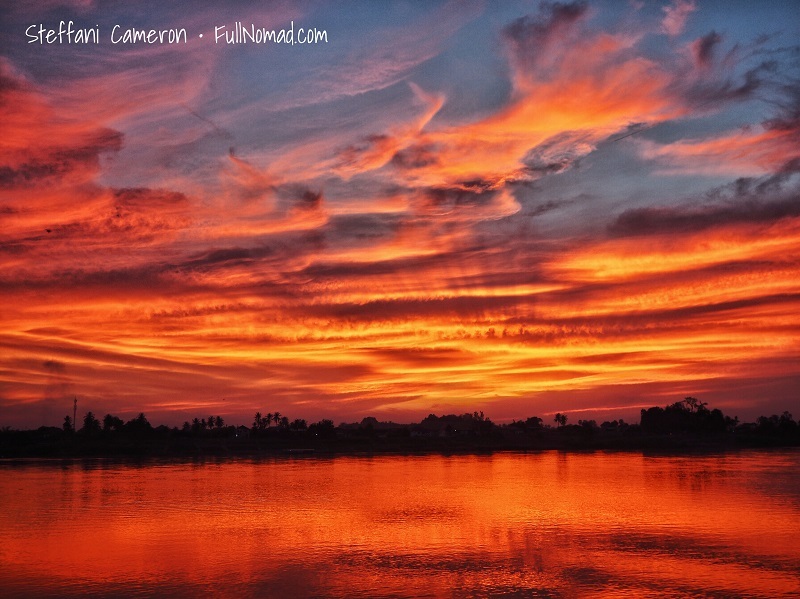 Cloud formations create a box-like sunset look over the Mekond River as the sun sinks into Laos after a cloudy day. In the summer of 1999, I was transfixed during a lull at work in the bookstore, reading Hot Zone by Richard Preston, about an Ebola virus outbreak in the USA. Captivating, compelling, smart, terrifying. I devoured that like a pothead on a Domino’s Pizza. Finished it seemingly overnight. But it’s the last time I remember a book captivating me so thoroughly (outside Harry Potter, of course). That month, everything changed. Mom died. I lost my focus, didn’t care. Few years later, had a head injury. Then social media came along and what little remained of my attention span was gone. Just this week I realized it has been 18 years since I was a regular reader. I used to be able to say, “I was an avid reader until recently.” Now that’s a lie. I was an avid reader until nearly two decades ago. So, while here in the sleepy enclave of Mueang Mi, I’ve rediscovered reading and music, things that once moved my world, changed me, inspired me, provoked me. What is it about becoming an adult and experiencing adversity that shoves us toward forgetting to do and enjoy things that once spoke to the very soul of who we are? Because reading and music were like that for me. Until one day they weren’t. And maybe that’s been part of the problem with all my travelling. I’ve travelled, but it wasn’t so much that I needed to get lost to become found, but that I had to start remembering from whence I’ve come so I could even decide where to go. But losing ourselves, and not in a good way, seems to be a rite of passage in adulthood. So, I’m reading. Not as much as I’d like because – groan – work beckons, but still reading more than I have in years. There’s a way to go till I’m that girl who’d read long into the night, who’d lose track of her days in a landscape of words, but I’m pointed in the right direction. My Kindle is now fat with tomes waiting for me to fall into nouns and verbs. Funny biographies, matter-of-fact curmudgeonly travel writing, and heart-rending tales set in exotic lands that soon will have stamps in my passport. 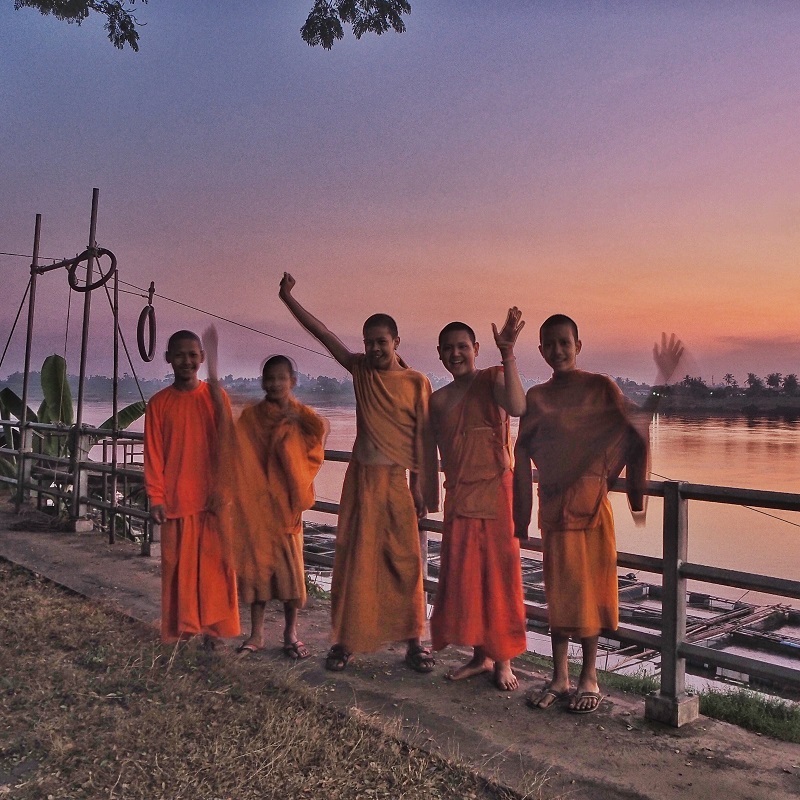 Every day the young monks pass by. Sometimes they say hi. Being a young monk means getting a good education. Many will not become initiated. For a long time, I’ve had a faker’s mindset about writing. Do it, pretend hard enough, and I’ll fool ‘em all. Sure, I know I can spin a phrase – I’ve spent my life learning the craft. But if I’m not reading, I’m not going back to that wellspring of language and style, tone and contrast, texture and ingenuity. There’s nothing rich or vibrant, refreshing or crisp about what I’m doing. And I know it. So that I’m-a-writer thing is great, but for ages I’ve felt stagnant and mojo-less with writing. I want new words, new lines. I want to bubble with better expressions, not grasp at tired phrases. Reading, then: helpful. Music too. And now, finally, that last ingredient needs to be a player again: Travel. Thankfully, I’m getting the itch for newness again. Critical, if one is to be a nomad. “At these prices I could stay until my visa ran out, months from now. It is sometimes that way in travel, when travel becomes the opposite: you roll and roll and then dawdle to a halt in the middle of nowhere. Rather than making a conscious decision, you simply stop rolling. It had happened before, and I knew why. “At a certain season of our life, we are accustomed to consider every spot as the possible site of a house,” Henry Thoreau wrote in Walden. For the traveller, this season never ends. One of the most stunning sunsets I’ve ever seen, after a very cloudy day. Photography does a good job, but it pales compared to nature’s awe. This year, I’ll seek a place to happen. A place to dawdle to a halt, where it’s good for my soul and great for my brain. Quiet, simplicity, focus. These are needed, but I have not allowed myself to have them. Perhaps reading will become the calm in the storm of my travelling days. Who knows. All I know is, I came to the Mekong River in the hopes of finding what I thought I’d lost. Maybe I found it, maybe I fixed it. Maybe I just aimed a little light at my darkness. But sometimes we think we need something – a thing or a place or a time – and rarely are we lucky enough to get things right and give ourselves exactly what we need. And so it is that I have lately awoken excited for my future, after nighttime dreaming of travel’s possibilities; of the lessons travel is bursting to teach, the history it’s primed to share. 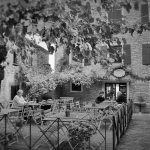 Travelling, like nothing else, is a writer’s master class, where we learn to observe and understand and explore, to question, to rage, to dream. With five days until my next country, my passport and Kindle are ready to go. Get ready, because this year writing and me are taking the long way ‘round.